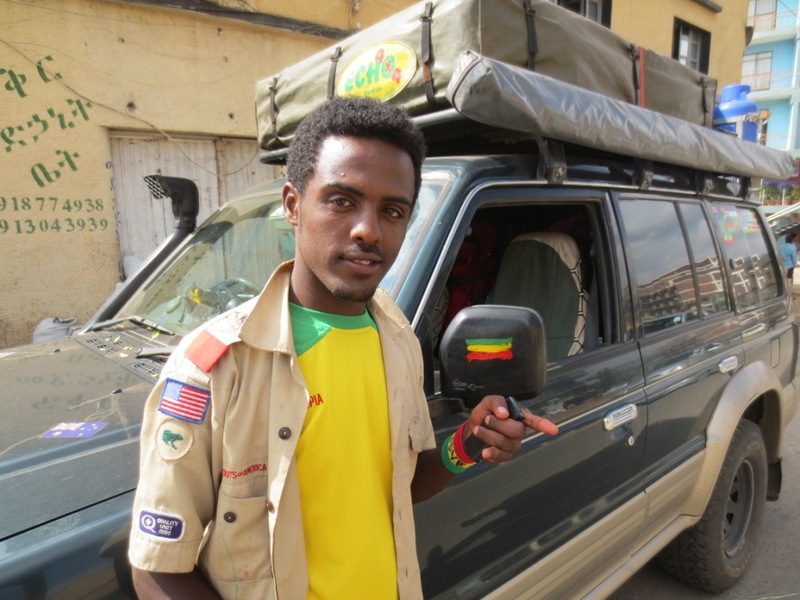 Never has a country divided people’s opinions so strongly, as Ethiopia does. It really is the marmite of Africa, you either love it or hate it. For us, we are definitely marmite lovers and all our preconceptions about what Ethiopia would be like, were completely wrong. For a start, the images of drought stricken land, famine and swollen bellied babies that we grew up with are fortunately now a distant memory for most Ethiopians. The countryside is green and fertile and agriculture is now the biggest industry here. The population is massive, around 85million, so yes there are people everywhere but we found them to be just as welcoming and friendly as anywhere else we’d been, not at all aggressive or hostile as we’d been lead to believe. No matter where you stop, even if it is seemingly in the middle of nowhere, people appear from out of the bushes. 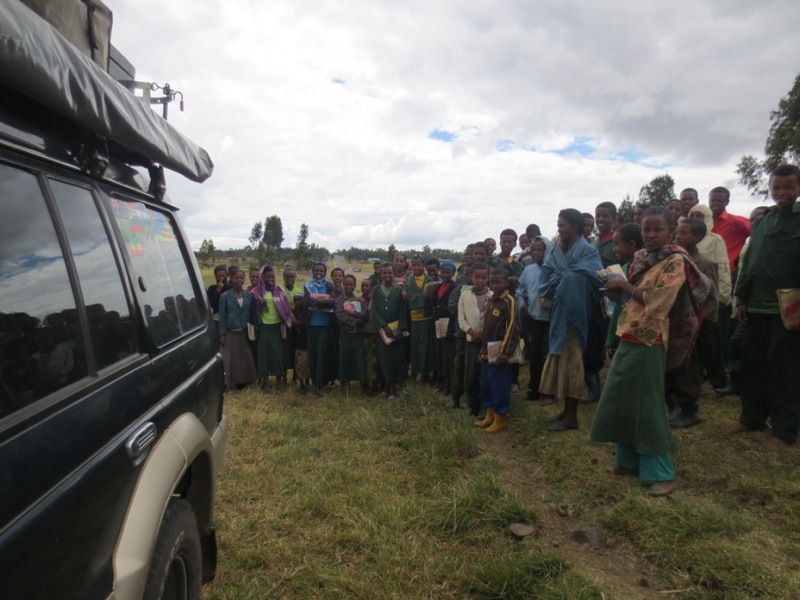 At one point, we pulled over to make some coffee and within minutes we had an audience of over 50 children! A quick coffee stop draws a big crowd! Unfortunately the only English word that everyone seems to know is ‘You!You!You!’, which you can hear being yelled at you from all sides as soon as you drive into any village. It’s not quite, ‘hello, how are you, welcome to my beautiful country’ but as it’s the only word they know, i’m sure that’s what they really mean! As the only African country to have never been colonised (apart from the Italians who claimed it for 5 years – long enough to leave their pizza recipes behind – thank-you!! ) Ethiopia is the first country we have been to which has it’s own real identity and unique culture – including it’s own calendar which is 7.5years behind everyone else (!) making it an absolutely fascinating place to explore. Following our adventures out of Kenya, we literally collapsed into Moyale. Fortunately the border crossing was pretty straightforward and the immigration guy even came back from lunch early to check us through. However, before we had a chance to pump the tyres back up, a nine inch nail delighted us with our first puncture of the trip! 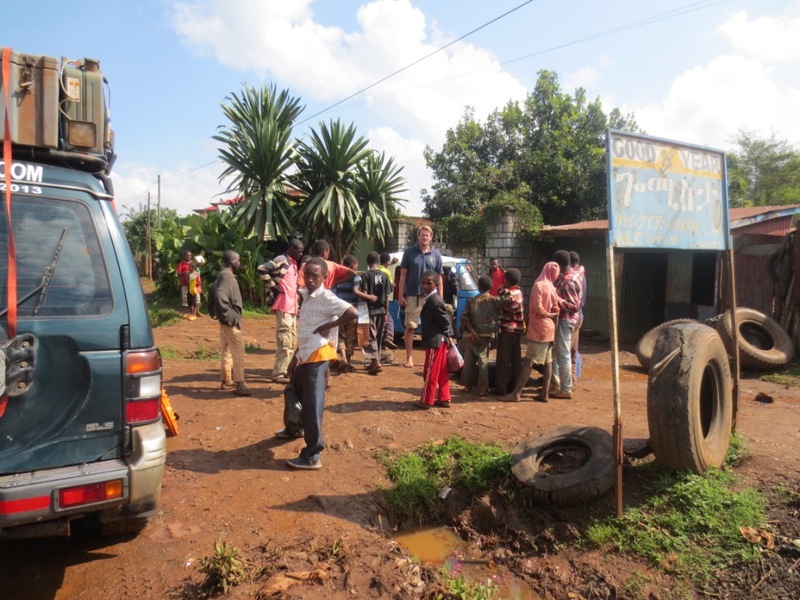 We pulled into one of the tiny tyre repair shacks and got to patching up the hole in the tyre. By the time it was finished, it was getting late so we drove back down the high street to try and find somewhere to sleep for the night. 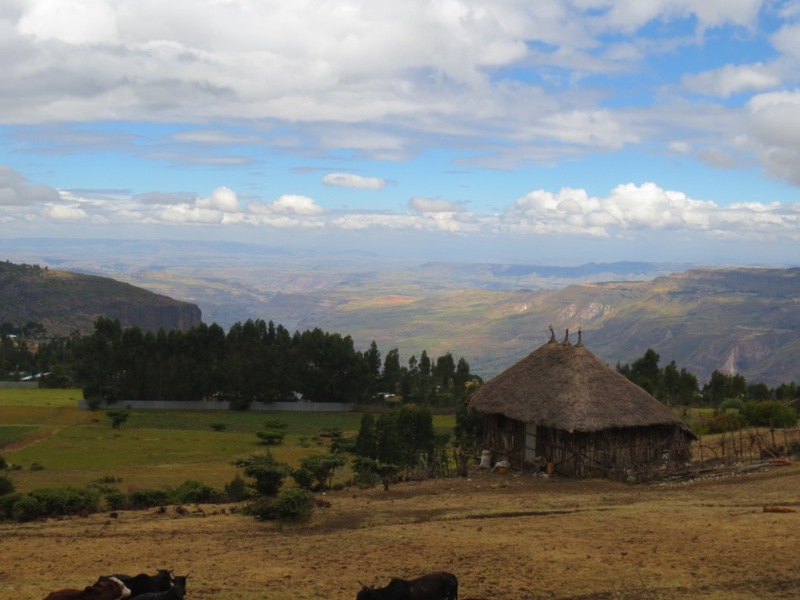 Ethiopia isn’t really geared up towards campers, so this is our first country where we regularly stayed in hotels – but at $15-$20 for a room and $10 for two of us to have a two course dinner and beers dinner it still worked well within the budget. Border towns are never pleasant and Moyale is no exception. As we sought a bed for the night we spotted a number of NGO vehicles parked outside one hotel so figured it would be our best option. Despite our tiredness, we had a really lovely evening with the local NGOs and tried our first tastes of Ethiopian cuisines – Injera (a sour grey pancake) eaten with an assortment of different spiced meats and traditional coffee, which was as coffee lovers, was sensational. The room itself was simple and despite the horror stories about toilet facilities in North Africa, our bathroom was ok! But from now on, there are some important hygiene rules to remember – always roll up your trousers before entering, don’t touch anything, take your own loo roll and always shower with your flip flops on! Despite our best plans for sight-seeing in Ethiopia, the car had other ideas. Following the extreme mud on the Marsabit:Moyale road, although the car came through it surprisingly well, the engine had suffered a slight injury as mud had forced its way into the alternator pulley bearing creating a deafening squealing sound which needed to be looked at sooner rather than later. 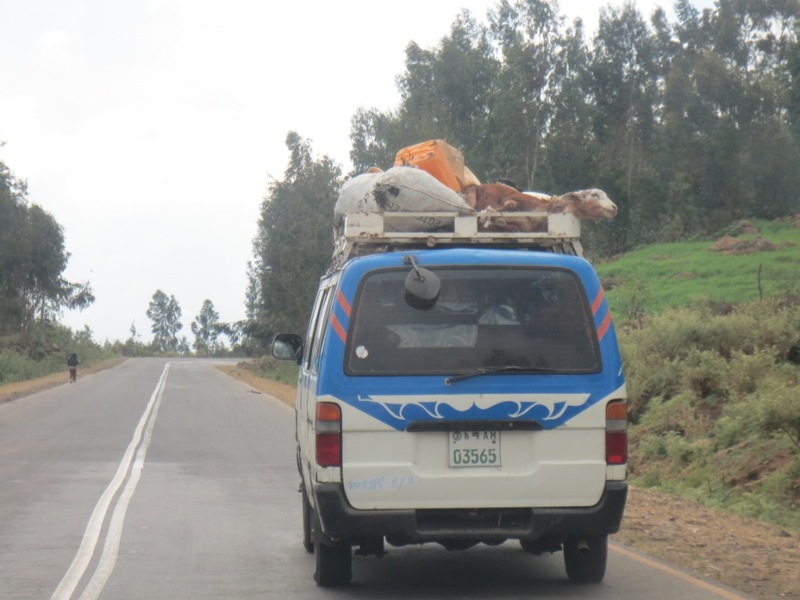 So instead of heading into the lower Omo valley region to see the different ethnic tribes, we headed straight for Addis Ababa. The drive was still beautiful, but the wonderful tarmac we’d been promised soon turned into broken and pot-holed road and to celebrate my birthday we were given another puncture – 2 in 2 days! Standing in the rain by the roadside, fixing a flat tyre on my birthday is not exactly how i’d planned to celebrate another year, but that’s overlanding for you! We headed onto Awassa for a lovely stop by the lake, where we decided to celebrate both our birthdays properly at a fantastic little Italian, gorging ourselves on pizza and red wine! The next day we headed onto Addis which has to be said, is probably the worst African city so far and as the base for the African Union, i was really expecting a lot more! Developers have decided to dig up the entire city centre road network in one go to make way for a new metro line, meaning that the whole city is a construction site. 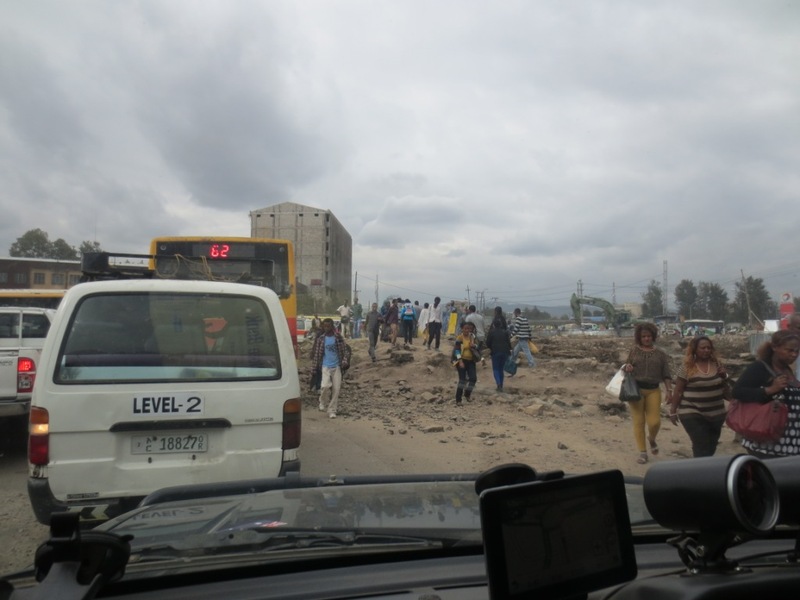 The traffic was abysmal and the pollution so bad we wheezed the whole time we were there – we really do not enjoy our time in African cities! Fortunately, we had a nice, if noisy, place to stay at Baro Pension where the very helpful manager allowed us to camp in the carpark. After checking out the rooms we decided we’d be happier in our tent! We met two other groups of overlanders, 3 guys biking down the length of Africa and 2 Frenchies touring Africa in a Fiat Punto! 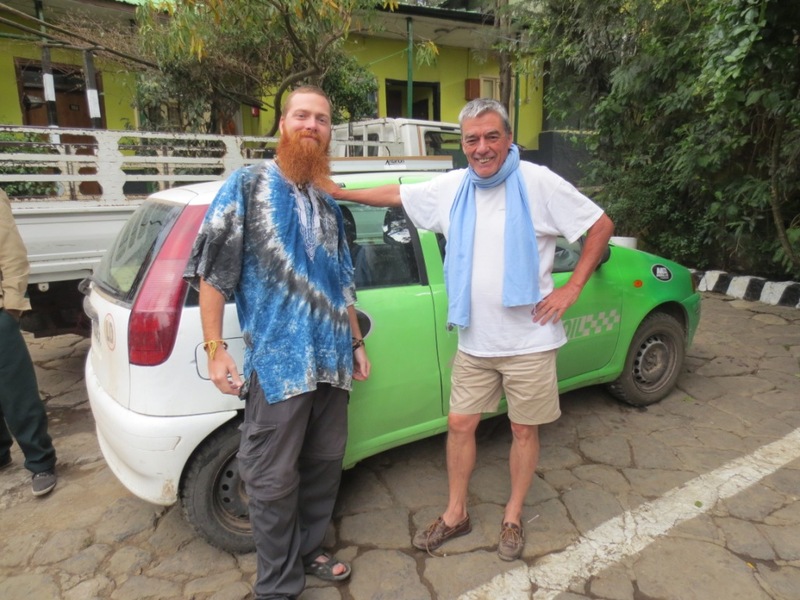 This little car, has in fact already completed 3 circuits of Africa and with 430,000klms on the clock they proved you don’t have to have a 4WD to travel Africa……although keen to hear they go through Northern Kenya! The Frenchies and their Fiat Punto! For Richards’ birthday celebrations we spent the day at Ethio-Nippon – the main Mitsubishi dealership in Addis. The team here, could not have done more for us and gave us the most fantastic hospitality and service. Typically the part we needed was specific to our engine, and no replacements could be found anywhere in the city and so we began discussions as to how long it would take to order one in – the birthday boy was not looking happy. As our faces looked more and more glum, the manager said he could try one more option for us, a black market option, which would be more expensive but they might have what we needed. Sure enough a few phone calls later, we were jumping into the car with the manager and heading off into downtown Addis where a dodgy looking guy, in a pokey little shop produced exactly what we needed! A genuine Mitsubishi part. He Of of course he charged us triple the price, but in that situation we had no choice so paid the extortionate fees and raced back to the garage to get the part fitted. 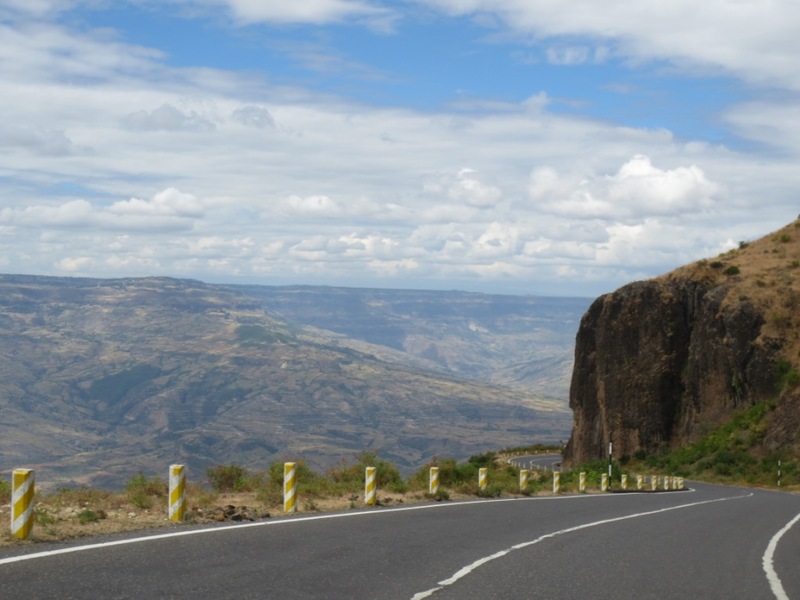 The extra time taken to get the car fixed up in Addis, also meant we no longer had time to visit the Bale mountains and the famous rock churches in Lalibela and instead needed to take a shorter route up to Lake Tana. Fortunately, the drive did not disappoint. 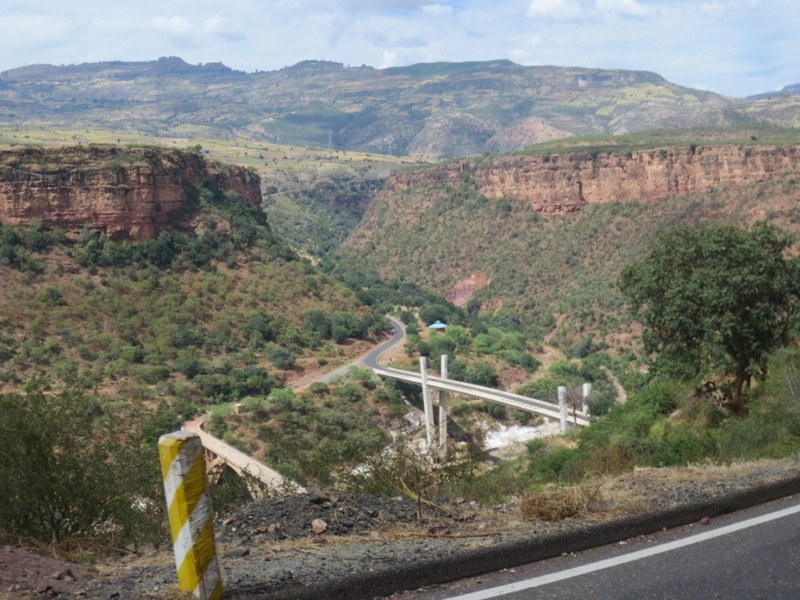 The scenery was spectacular and as we drove out of Debre Markos the road wound it’s way down steep hairpin bends to the Blue Nile valley below, dropping over 1,000m before beginning the climb back up the otherside. We reached Bahir Dar at the bottom of lake Tana, which although described as the ‘Riveria’ of Ethiopia did little for us, so we decided to push onto Gondar. 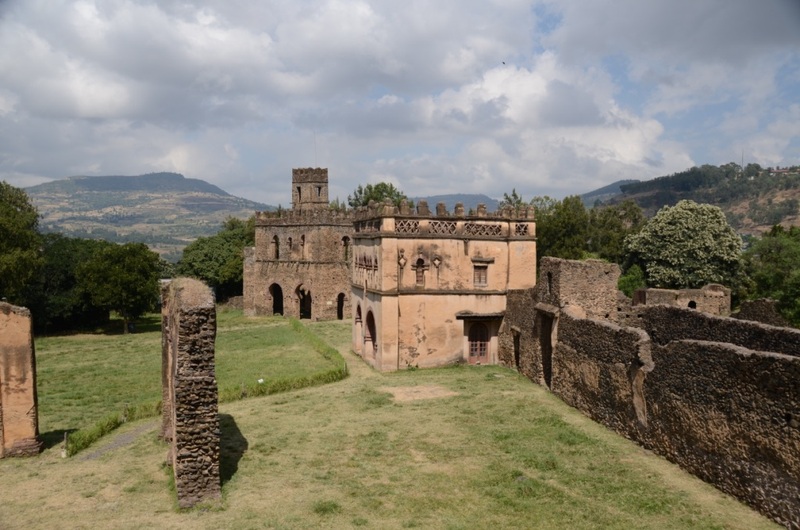 Gondar is described as the real-life Camelot as it contains a central walled compound containing 6 different castles built by different Emperors in the 17th century. We stayed at a fantastic place called Fasil lodge, where our first evening was spent sitting around a fire in the courtyard with the hotel owner who told us a lot about the history of the city and the culture of Ethiopia. As it was Friday night, the Coptic Christian prayer calls continued all night, which when sitting around a campfire with a glass of wine is rather atmospheric, but at 4am when you’re trying to sleep it can get pretty irritating! 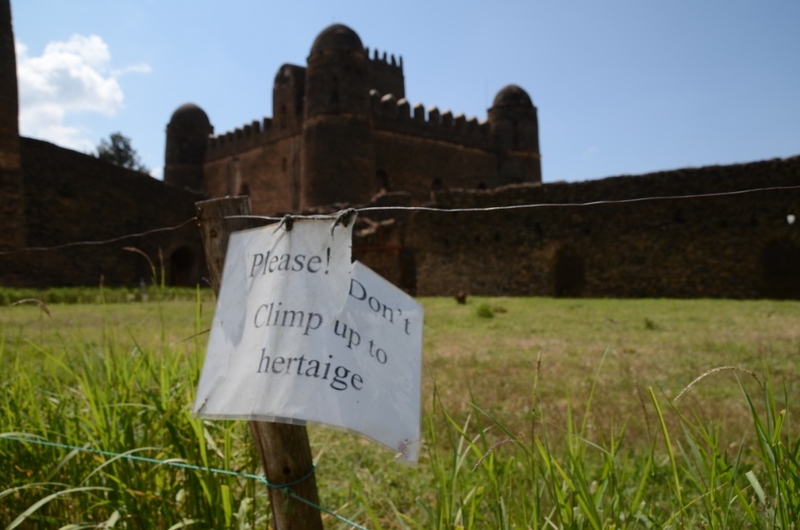 We enjoyed a fantastic few days in Gondar, exploring the castles and the old town. 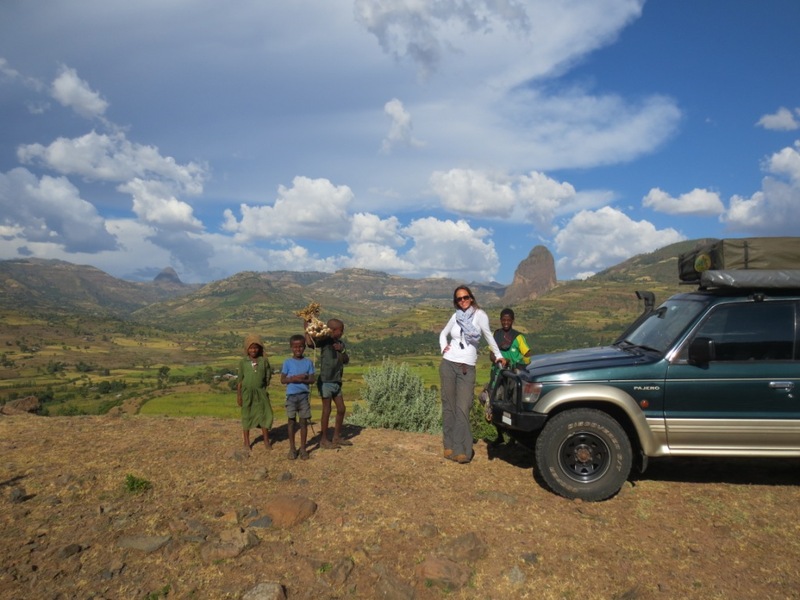 We also tried to venture up into the Simien mountains, but park rules require each vehicle to carry both a park ranger and a scout – as we only have 2 seats they wouldn’t let us in unless we hired another vehicle for the company. ! They were our first and only unhelpful Ethiopians that we met and back in Gondar, our hotel owner was so disgusted that he was going to report it to the tourism board! Arriving back in Gondar, we also found that the fantastic Fasil Lodge was now solidly booked out – it was a big weekend across the country as Ethiopia faced Nigeria in the world cup qualifiers, so the whole town was full of football fans who’d come to watch the game on the big screen in the Piazza. The owner however took us to another hotel in town which despite being much more expensive only charged us the rate we would have paid at Fasil. It was a great atmosphere in town and from the roof deck we could see over the rooftops of the whole town and watch as thousands of people piled into the town square to watch the game on the big screen. Everyone was dressed in Ethiopian colours, and had their faces painted in green, yellow and red so we joined in and got flags painted on the car too. Sadly they lost, but everyone still remained in good spirits and there was no childish/loutish behaviour that is often seen after England lose a big game! Our final stop in Ethiopia was at Gorgora on the top of Lake Tana, at Tim and Kim’s rest camp. A beautiful spot to relax for a few days, parked up under their huge fig tree with views across the lake. We enjoyed our final beers and began to get organised for our trip into Sudan – another overlander, Kevin O’Keef who is travelling down through Africa on his motorbike, gave us maps and lots of information about Sudan. 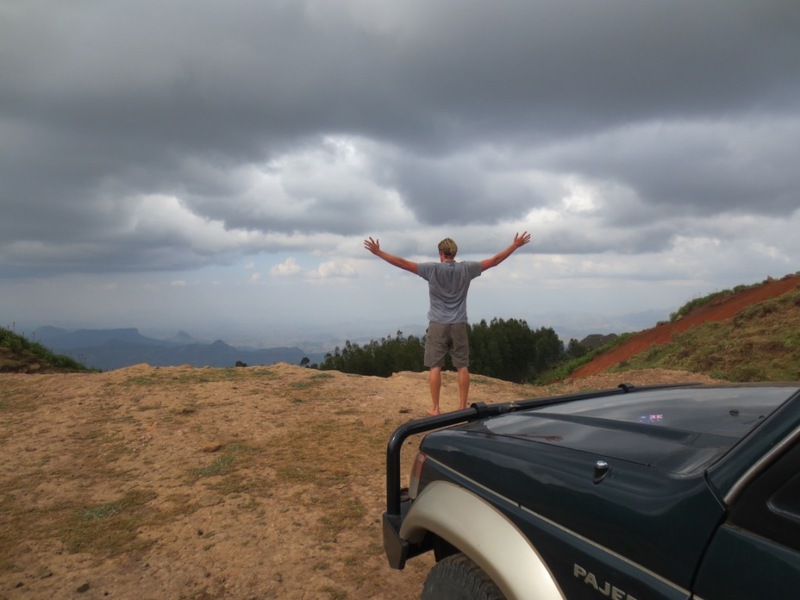 Another country, which if you believe everything you read you’d never contemplate going to, but from everything we’ve heard from other travellers it is actually one of the most friendliest places you can visit in Africa. We headed out towards the Sudanese border, but before we could get there not only did we get another puncture, our third in Ethiopia(! ), but unbeknown to us the trauma of the previous corrugations had split the right hand side bracket holding our bull bar on! It only took a small bump to prise off the remaining weld and with a bang the bull bar was hanging off! Another bush fix and Rich’s handy work had the bull bar tightly strapped back on, much to the amusement of the locals who came to watch. We hoped the ratchet strap would hold it in place until we could find a welder. We were incredibly sad to leave Ethiopia, it is is the first country that we feel we didn’t really begin to scratch the surface of. There are so many amazing places that we still both want to see, so we’ll just have to come back another time!